When we are sick, or suffering discomfort from diarrhea or indigestion, we take medicines to make us feel better. We know what ails us, and we know what can help us. Monkeys, too, seem to have knowledge of the therapeutic. New cases are reported every year, and zoopharmacognosy, the study of self-medication in animals, is a growing field. The fur-rubbing white-faced capuchins and the charcoal-eating red colobus monkeys seen in Clever Monkeys are just two examples of medical ingenuity in primates. Across the globe, monkeys have figured out remedies for common ailments, just as we have. One of the greatest dangers to monkeys, and one of the greatest annoyances, are insects and parasites. Ectoparasites like lice, ticks, and mosquitoes carry many diseases to which monkeys are susceptible. Evolutionary biologists believe that parasites coevolved with their hosts over eons, and both humans and monkeys have continually sought relief from these pests. Itching, scratching, and swatting are the only options for most animals, but primates have evolved several novel approaches. Grooming is an effective way to pick off pesky bugs, but the white-faced capuchins seen in Clever Monkeys take pest control to another level. They rub themselves with leaves from the piper plant, which is also used by some people in Costa Rica as an insect repellant. The piper leaves are also antiseptic, which helps ward off bacterial and fungal infections. 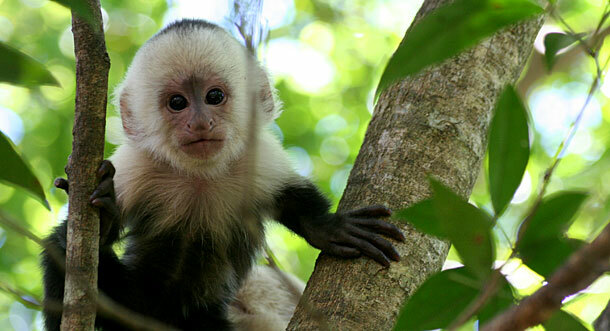 Fur-rubbing episodes in the white-faced capuchin monkeys correlate markedly with increases in humidity. The capuchins know that increased humidity means an increase in the abundance of insects, and the risk of bacterial and fungal skin infections. Capuchins also sometimes rub their fur with millipedes that contain benzoquinones, chemical compounds that repel insects. Owl monkeys and lemurs have also been observed fur-rubbing with millipedes. Only in the capuchins does fur-rubbing play a social role. In Clever Monkeys, the white-faced capuchins become quite excited and enthusiastically gather together to anoint each other with the piper plant. What underlies this party-like behavior is a simple protective measure for the group: each member of the group benefits if the group as a whole is protected from parasites.